The concept of innovation as we knew it is effectively and functionally dead. It’s meaningless. It doesn’t really mean anything anymore and it’s lost its meaning mostly because we beat the crap out of it for about twenty years, telling everybody to do it. Then we realized, as we started looking through the numbers, that the truth was everyone was getting hung up on two parts of the innovation story. One of that was technology and the other was business model. It was missing this whole other throughline that was happening almost daily in our lives which no one was paying attention to which was the institutional shift. Around 2009 when the recession hit, we all entered into probably the largest mass institutional shift in the history of our species. We are basically in this moment in time where we are setting a rewrite button or pressing the reset button on the operating system of our planet. 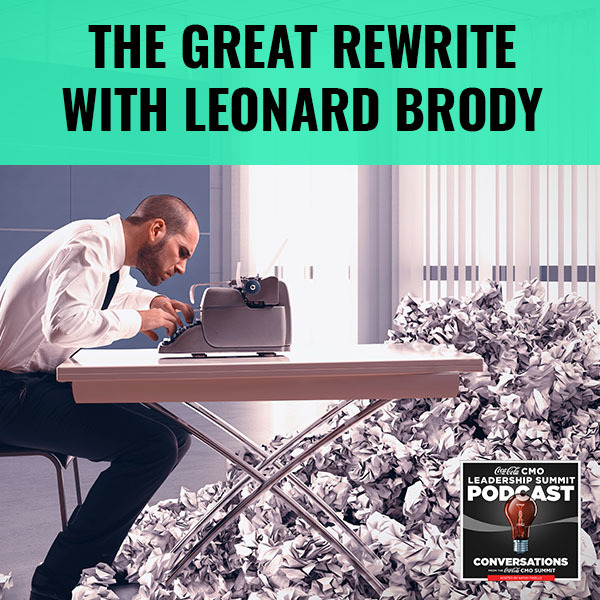 Venture capitalist, author, and media commentator Leonard Brody talks about The Great Rewrite of the innovation story after the 2009 recession, specifically in the sports and entertainment business. 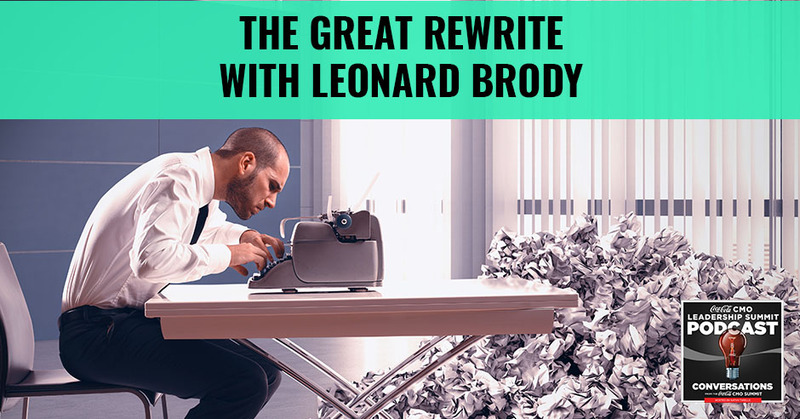 This is the full presentation of Leonard Brody’s talk titled “The Great Rewrite” from the 2017 Coca-Cola CMO Summit. I’m going to try to break down for you what has been about seven and a half years of research. What I’ll talk to you about and just give you a window into is project and a partnership between myself and Forbes Magazine in New York. The partnership was really born out of a realization that I had had about 2009, that the concept of innovation as we knew it was effectively and functionally dead. It was meaningless. It didn’t really mean anything anymore and it lost its meaning mostly because we beat the crap out of it for about twenty years, telling everybody to do it. Then we realized, as we started looking through the numbers, that the truth was everyone was getting hung up on two parts of the innovation story. One of that story was technology and the other was business model. It was missing this whole other through line that was happening almost daily in our lives, which no one was paying attention to which was really the institutional shift. What I would argue is around 2009 when the recession hit, the data shows us very clearly that we all entered into probably the largest era as mass institutional shift in the history of our species. You are basically in this moment in time where we are setting a rewrite button or pressing the reset button on the operating system of our planet. In doing so, we started drilling down a little bit more. By the way, you can see this on Forbes.com and take a look at it. It’s coming out as a book in about twelve months and I’ll just give you a bit of a preview of that but it was very clear that when we would start talking to C-Suite executives and start looking at what they were doing day to day around innovation, they all knew. The story is different now than it was a decade ago because a decade ago, innovation or that change, that story was only relevant to a certain small number of executives. The Great Rewrite: A decade ago, innovation or that change or that story was only relevant to a certain small number of executives. I think everyone sitting knows and generally the vast majority of people that are at the V-level or C-level at companies understand that it’s important. They might not understand the execution side of it, how to do it, but they get it. They understand that it’s relevant, but if you sat them all down and said why and tried to ask the question, “How did we get here?” it was pretty complex. Let me give you a sense of how I got here and how the story started for me. This is my Uncle Izzy, who I’m sure you all know. Uncle Izzy was one of the greatest entrepreneurs in Canadian history. My family grew up in the media business. We owned a very large broadcasting business, the largest television broadcasters in Canada, Australia, New Zealand, Ireland, and then owned most of the daily newspapers in Canada with the exception of a couple. While other kids were focused on talking about stuff at the dinner table that kids talk about, we were focusing on the future of broadcast and the future of human communication and what that was going to look like. This company started literally from the sweat off of a back of a truck. My uncle was a political figure in the province of Manitoba, which hopefully none of you have had to go to. In Manitoba he was the leader of the Liberal Party and he realized after literally six weeks in office that he didn’t have any power and really the power belonged with the media. He decided literally at that moment, he was going to end his term and become a media baron. Then he had to figure out how to do that. He put a flatbed truck on the highway, drove it to Minot, North Dakota, picked up a television station, literally picked it up, put it on the back of a truck and brought it to Winnipeg, Manitoba. That became a roughly $7.5 billion a year revenue business. The sad story about that was about seven years after he passed away, the company effectively was sold for its parts. It was sold for parts would be a gross oversimplification to say that it happened because of one or two things. It was a lot of things and a lot of financial engineering, but one of the core through line stories of that was the company failed to pay attention to the signals. They were consistently knowing that there was change going on and they knew that something was happening, but they were very poor at responding to it and it was always the next step. It was always something they would get to or something they would deal with and unfortunately it dealt with them. I watched a business go from the back of a truck well before I was born to $7 billion a year in revenue to effectively bankruptcy. When I talk about this rewrite stuff, I take it pretty seriously because it affected me and our family very seriously, so much so that in 2004 I decided I would start my own news agency. We started effectively what would be best described as an associated press of the people. We were really the pioneers of citizen journalism. The company we started, which is called NowPublic, sits in the Museum of the First Amendment in Washington as really the people who kicked off the concept of, “You and I would be in a room and we’d be seeing stuff that reporters couldn’t see, so therefore it would be logical that the news of the future would come from us.” Roughly around 2009, I sold it. In 2009, I became the chief innovation officer. Chief innovation officer is probably the best way to describe it, chief digital officer is probably my actual title, for the Anschutz Group of Companies. For those of you that know Anschutz, it’s the largest live sport and entertainment business in the world today, roughly about 70,000 employees globally. We own brands like AEG, which owned a bunch of sports teams like the Los Angeles Kings and the LA Lakers. We were the founders of Major League soccer, with the Hunt family. Us and Live Nation are the two largest live concert exhibitors in the world. We would seat roughly 350 million people a year, including the Emmy’s and Grammy’s, which was another property that we owned. When I walked in the door, I realized I became the head of innovation for this very large company and two things were very clear right at the beginning. The first was Phil who was at the time 77 years old and has no cell phone and no computer still to this day, that’s a bit challenging to try to explain innovation to someone. Secondly, my first conversation with Phil about innovation was he said to me, “I’m going to tell you what we do here. What we do here is the most traditional of industries. We take physical people. We put them in physical places. We entertain them with other physical people. We feed you. We get some booze in you. We get you out of here as quickly and safely as we can do. If you can innovate that, Godspeed to you.” The conversation was like walking someone who visually impaired through an art museum minute by minute, but the reality was he inevitably got it. What I’ll show you a little bit later on is not only how we rewrote the entertainment business, but also how we rewrote the human form. Much of what I’m going to talk to you about is really a part of the genesis story for my trying to explain to Phil why this mattered. The Rewrite really was born out of trying to explain to a guy with no cell phone and no computer and couldn’t care less about innovation why it was critical for the business. What I want to try to do is give you a sense of what I’m doing now. As Pat mentioned, I’m a partner with CAA, which is the largest talent agency in the world, but I run a very specific division of CAA. I run a division of the agency that’s focused on building new assets from our talent. My job is functionally to put the agency out of business. This is not theory for me. I’m not here discussing theory with you. I’m going to talk to you more about what I do literally on a day-by-day basis and the models that we’ll see that work really, really well are when you spend a lot of time thinking about actually investing and wading in the waters of the people that are putting you out of business. You need to be in the business of putting yourself out of business and that’s exactly what I do at the agency. My job is to create new product that grows and creates a bigger enterprise value than the agency itself and our assets. As an example, this was a new company that we’ve just launched with Emma Roberts, a very talented young actor, called Belletrist, which was a targeted 18 to 34-year-old product for women who like to read and are really interested in fiction and fan fiction. What I’m going to get out with you is not about theory. It’s about what we do every day and the insights that we’ve gathered from doing this for a few years. I’ll talk to you about The Rewrite. I think it’s worth mentioning and repeating that you were living in the largest era of institutional shift ever in the history of our species. I want to then try to walk you through what I think are the three most important lenses in consumerism. You, as marketing executives probably read ad nauseam about all of the stuff that’s coming out around the consumers and consumer vision. I’ll just try to give you our take on the stuff that we have found out I would say over the last eighteen months to be the three most important things we focused on. CAA is really interesting because we sit as air traffic control for an incredible amount of consumer data. I would argue in some respects we have some of the best consumer data in the world because we see it coming from all angles, from media and consumer products, CPG, we’re in the middle of all of those conversations. Then I want to talk to you how This Rewrite is going to affect the consumer marketing sectors and again, I recognize many of you are from a diverse amount of industry so I don’t want to try to overstate it, but I think it will apply generally to the consumer sector and then what do you do about it. What does the data show us that organizations are going to be able to do to stay relevant in the world that’s being rewritten around them? Let me start with you because I would argue that over the last 100 years, we’ve completely rewritten the human being. You are functionally not the same human that walked on this planet 100 years ago. If you look to the rise of the consumer internet around the late ‘90s, behaviorally, you are also unrecognizable compared to the people that walked on this planet. If I asked you as an American, and I said, “Is this last 100 years of growth and innovation, are we better off?” 4% of you would say yes, generally speaking. This data is coming out of Oxford’s new economy school. When they started asking Europeans that question, “Are we better off? Have we advanced over the last 100 years?” That number rose to about 9%. I will show you not only how different and how wrong that is, but how we have literally taken almost every splice of what you would consider important in civilization. If we sat back 100 years ago and said, “Show me what this world is going to look like and be a better place in 100 years,” how are we doing? It starts with physical things. We have 2.5X, it’s actually 2.8X human life expectancy in the last 100 years. The average person alive in 1900 in the western world lived between 42 and 45 years of age. Now, you are now somewhere between 82 and 87 depending on where you live in the world. It has also physically changed us, so the average person walking on this earth now is about three to four inches taller than the average person who walked here 100 years ago. If you go to Europe and you walk through the medieval castles, you get that sense pretty quickly. You’re like, “Who are the Oompa Loompas that lived in here?”You realize we’re just physically bigger people. If you think about things like poverty, in 1900, nine in every ten people on this planet were living under the United Nations definition of abject poverty. Now, that number is one in ten. 10% of 7.4 billion people is a pretty significant number, but if you looked at it at a relative ratio, we have literally eradicated poverty from where we were 100 years ago. Then you think about democracy, one in every 100 person had access to a democratic institution in 1900. Now, that number is 56. Literacy in 1900 was 12%, today it’s 85% and that almost maps identically to education, which was at about 17% in 1900, today at 86%. Are we better off? Yes, we’re way better off, and much of what we’ve done from a progression is unfortunately going unnoticed because when you ask us if we’re better off, everybody says we’re not. Here’s the reason they say we’re not, because everyone will say we pay the price for that, we work too hard. We’re slaves to technology. We’re slaves to devices. It turns out that’s just totally wrong. That in fact, the average person in the western world today works almost half the number of hours that a person living in 1900 did. If you think about the fact that we are living longer, were physically different, we’re better educated, more literate, better access to democratic institutions, it would be naive to think that the consumers walking into your facilities every day are not functionally different people than the people who walked here 100 years ago. Here’s where the problem starts. It starts with the houses that we built, because if you think about institutions and by institutions I mean anything that governs our lives, education, religion, government, the family unit, they are all going through this incredible shift and this incredible change. I would argue that the underlying dysthymic stress that you all feel, that we all feel just being alive, forget about what you do for a living, but just the pace of change that you were experiencing and seeing whether it’s climate, work, family, your children. A huge amount of that stress has nothing to do with technology. That in fact technology is the least important driver of why this world is being rewritten. The biggest driver sums up in a sentence, which is, “You are living in the disconnect between the people that we have become, the tools that are now available to you, and the failure of our institutions to keep pace with that.” That is truly the underlying story around why most of us are experiencing deep chasm in almost every institution we deal with. I’ll give you an example of that. We did a movie at Anschutz called Waiting for Superman. I am encouraging you to take a look at it. It was done by Davis Guggenheim and it was about the failure of the American education system. In doing that movie, we discovered that this year, 35% to 37% of American high school students will drop out, 35% to 37 %. That number is way too statistically significant to say anything other than the institution is broken. The houses that we built don’t fit the people who walk on this planet anymore. One of the drivers behind that is actually a process called inversion. Years ago we did this exercise at Anschutz where we had a lot of our clients, which were a lot of the Fortune 500 companies come, and we asked one question which was, “Tell me why the internet’s important.” Out of the 400 people that submitted an answer to that question, there were literally 220 different answers. When we started digging into it, I think we came up with what I believe is the reason the internet matters and it’s this and it’s very simple. The internet matters because for the first time in the history of our species, we own our own communication at mass scale on a global level. You have to think about that. For 6,000 years of recorded history, human beings did not own their own communication. You can look through the history of broadcast, look through the history of media as a bellwether of that communication, and you will see that every single one was identical from the Gutenberg moment to television. They were broadcast. They were one–to-one or one-to-many. They were incredibly expensive technologically. There was typically a government regulator that you needed a license to get from in order to be able to communicate. It was a complete bottleneck around human’s ability to communicate. It matters because you own your own communication at scale at a global level for the first time ever. What that meant was, if you look at our institutions, we typically worked on a power pyramid structure, almost every one of them. Whether you had a pope or principal, a prime minister a head of family a president, they all worked on this power principle. The Great Rewrite: You are functionally not the same human that walked on this planet 100 years ago. What the internet does when you own your own communication scales, it inverts that cycle. We are witnessing this inversion of this power structure and now where you are in that inversion depends on what industry you’re in and where you live, but arguably in the western world, we’re somewhere around here. Part of that weirdness you feel every day is this societal seasickness with the lack of understanding of what happens in a wobbly world where we’re inverting those power structures. By the way, if you’re in the CPG business or anything to do with consumers, you are fully inverted. It is flipped. I think you inherently know that, but all you need to do is just look at the examples and the case studies. You can look back to the United situation where that poor doctor got pulled off a plane. If that was ten years ago, United wouldn’t have returned a phone call. They’re paying $10,000. Actually apparently now you get to name your price when you want to get left off of a United flight, which I will make a career of going forward, but the reality is you are fully inverted. The stress that you’re feeling is around this institutional shift knowing that that power structure is gone and how you rely and live in a world where it’s inverted. There are many, many drivers behind this rewrite. Again, I would argue this started this historical period started in 2009. Like many historical periods, it started because of a financial event, typically financial trauma, and in this case it was the recession of 2009. We don’t know why, but all we know is that there were a bunch of these things percolating under the surface that when that recession hit, it congealed and created this perfect storm that put us in this position that you were literally rewriting the planet from the ground up. We can’t go through all the drivers, so let me walk you through a few of them. The least important of which is technology. In fact, the only thing about technology in this change that matters is its cost and adaptation. Prior to AI, without human intervention, technology was predominantly a box in an empty room. What matters around the tech now is the tools of innovation have dropped to net effect cost of literally zero. Just to give you some context from my own life, the first company I built was an e-commerce company based out of Seattle. We grew that quite significantly based on a platform we had built, which in 1999 cost us $46 million to build on a fully burdened basis. The last investment I made in an eCommerce company was in 2015. Their engine was probably fifteen times more sophisticated than ours, which cost them fully burdened about $3,500 in 2015. Today, that number is about $1000. I could probably do it for under $1,000. It’s not just about the little stuff. You have to remember that one of the things that kept corporate America in its pole position was the barriers to entry around the cost of technology. Innovation was expensive. The tools of democracy works. The tools of innovation were not democratized, so they were fully expensive and now that moat is completely removed. Again, it’s not just the little stuff. It’s not eCommerce, mobile, social and that stuff. It’s big stuff like genomic editing. Are you familiar with CRISPR/Cas9? Do you know CRISPR? CRISPR is a genomic editing tool. Think of it as Microsoft Word for your genes. That tool took many years, more than a decade of creation, and roughly $2 billion to create. A high school student in Palo Alto or Saskatchewan could, within about three weeks of education and under $20,000 could, DNA edit out a species. If you don’t believe that, you can sit and watch the recent TED Talks of the founder of CRISPR to see just how concerned she is about this process. The tech is incredibly, incredibly cheap. Therefore, the moat that protected most organizations from the companies that we’re ending up at the gate is now gone. We’re talking about behavior. I believe that over the last hundred years we have physically been rewritten as people, but what’s happened since the rise of the consumer internet is we have in the last 25 years become unrecognizable in our behaviors. You are not the same people that walked on this planet 25 years ago. I’m sure half of you are saying, “It’s probably not true.” Thinking about Maslow’s Hierarchy of Needs, we’re all pretty similar behaviorally, you’re not. I’ll show you why, but let me give you some context. Let’s go back to the St. Mark’s steps in 2005 when Pope Benedict was anointed. The white smoke comes out of the flume, the Pope’s anointed. Let me share that exact same moment in time seven years later when Pope Francis is anointed. Many of you will have seen these pictures before, but you’ve seen them for the wrong reasons. What you were looking at is nothing to do with technology because in 2005, the point and click camera and the camera phone was fairly ubiquitous. What happened between 2005 and 2013? It’s the rise of social. The Great Rewrite: For 6,000 years of recorded history, human beings did not own their own communication. What happened in that was we became a culture of people who behaviorally got trained to share the moments of their lives in a very public way that would have been deemed rude or breaches of privacy only seven or eight years prior. This is not a technological adaptation. It’s a behavioral adaptation. Let me explain why. If Darwin were alive today, he would argue that we have evolved and the data would back him up on that. There’s quite a bit of data now coming out from the Sociology Department at Stanford and Oxford talking about something that’s science fiction talked about for 50 years, which was the human bifurcation. What happened around the rise of the internet is we gained our own communication at scale, which you bifurcated into two people. You are two human beings. You’re a physical person, the person that you are in face-to-face interactions with people is the best way to think about it, and you are a virtual identification, the person that you are in non-face-to-face communication. Things like phone calls and anything related to your mobile or internet or social. Why should you care about that? You should care about it because two thirds of the western world spends two thirds of their working day in their virtual identity and not their physical one. 63% of Americans spend their social time with their close family and friends in their virtual identity and not their physical one. 87% of statistics are made up right on the spot, by the way. The reality is you should care because we are living predominantly in this virtual ID and it turns out that the behavioral markers between your virtual identity and your physical one are very different. You would do things in your physical self you would never do in your virtual identity and vice versa. Getting this wrong is like walking into a Japanese restaurant and ordering in German. It is a completely different language. It has been, I would argue, the failure of marketing for almost twenty years. The success story of figuring this out started at Google. It started with the realization that if we believe in our virtual identities, which we do, that we have this declared intention, we’re doing something, it doesn’t mean we are, but the perception is in our virtual ID that we’re doing something. Then let’s make the ads part of what you think you’re doing, which is you’re asking a question, let’s make the ads part of the answer and let’s make it behaviorally non-disruptive to you. That journey began a whole change in the way we think about advertising and the way we think about advertising online. This I would argue is one of the most important sociological findings in the last two centuries. There are hundreds of these behavioral markers. We obviously don’t have time to go through all, but let me go through one with you, which is trust. You would think that you’d be way more trusting in your physical self because you can look at someone, shake their hands, read their body language, pretty intuitive. It turns out that’s wrong. The average Internet user in the western world is four times more trusting in their virtual self than they are in their physical one. We don’t know why yet. We don’t know the answer as to why, but we just know it’s factual. my father, who is an 80-year-old dentist back in Canada, I literally spent years trying to explain this to my dad. I finally figured out a way and I said, “Dad, when I was a baby, would you post my baby pictures on the lamp post in our neighborhood?” He looked at me. He’s like, “No, I wouldn’t do that. It’s illegal.” By the way, it’s not illegal. “I wouldn’t do that. It’s crazy. They’re freaks in our neighborhood. Nobody cares. Nobody’s interested.” He just went on. I’m like, “I got it.” “Tell me then, why do you post hundreds of photographs of your granddaughter on Facebook and Flickr, which is a globally open, searchable, and easily manipulated lamppost?” His face just went blank. Although, I saw him ten minutes later in his office literally deleting everything off of his computer on Facebook. The truth is we know the answer. The answer is because he’s more trusting. We don’t know why, but we just know that the markers are substantially different behaviorally. Let me touch with about the third big driver, which is capital markets. This is important to understand because for almost two centuries, the rules of the capital markets were pretty locked. If you needed large swaths of public money, you had to go public. In order to do that, you needed investment bank. That investment bank would do a bought deal where they would buy your securities and resell it into institutions. However, if you were a competitor to one of their bread and butter clients, you were just not getting represented and that was one of the major bottlenecks of global innovation and progress for almost two or three centuries. The electric car is not new technology. It was in fact available prior to the combustion engine. How then does Elon Musk, as smart as he may be, go from a seven decade long, multibillion dollar campaign by the automotive and petroleum industries to keep this vehicle from ever seeing the light of day to within nine years, making the electric car ubiquitous in North America, taking the company public, and now having the largest market cap of any North American automotive producer? By the way, the Tesla Model S outsells the BMW 5 and Mercedes E-Class combined in North America. How does that happen? The answer is Wall Street let him. He’s now in a position where lots of other entrepreneurs are going to be put in a position where in regardless of what sector you’re in, there will be a minimum of three or four companies with a billion backing, at least $1 billion US in capital, that’s coming to tip the balance of those power structures that were there before because the capital markets have fully inverted on that. Let me try to give you some examples of the context of this in your own lives and let me start with something that all of us think about or engage in, which is marriage. We now know at the end of this year, roughly at the end of December, 66% of all new marriages in North America will have originated online. You have to think about that contextually. That means that one of the oldest institutions in humanity, two thirds of us are engaging in that institution on a medium that didn’t exist 25 years ago. It’s a complete rewriting of the code of human pairing. By the way, the divorce rates for marriages that originate online or somewhere between 15% and 17% lower than the ones that originate in the physical world. Meaning the algorithms are right or they’re better, they’re more efficient. If you further that theme, this year alone in the western world anyway, there will be roughly three million children born out of dating sites or born over the algorithms derivative of dating sites. It’s a big fundamental shift. The Great Rewrite: For almost two centuries, the rules of the capital markets were pretty locked. If you needed large swaths of public money, you had to go public. I said to you in the Anschutz Group that not only did we rewrite the entertainment business, but we rewrote the human being and let me show you how we did that. What you’re looking at is a photograph of a human being and a not so human being. On your left is the rapper Snoop Dogg. We still own a music festival called Coachella in the Palm Desert where every April about 200,000 kids go and do things in the desert you don’t want to know your kids are doing and we decided to put this on stage. This is Snoop in human form and Tupac Shakur who died roughly twenty years before this photograph was taken. There’s a great video of this, I didn’t want to show it because it’s a bit graphic. This is not your old Obi-Wan Kenobi hologram. This is a $12.5 million, 3D CGI replication of a human being that interacts in a call and answer format with the fans on stage and performs live, as you can see with actual physical human artists. If you were watching the American Billboard Awards about a year ago, you would have seen and Michael Jackson died roughly two years prior to this. There were ten performers on stage, not a single human being present, and what was cool was Michael Jackson was performing a song he had recorded about a year before he died, but had never ever performed live. Why does it matter? If you go back to what Phil said, Phil Anschutz, “We take physical people and put them in physical places.” It turns out this is quite a big boon for the live entertainment business because virtual Michael Jackson can work 365 days a year, doesn’t get sick, doesn’t have a union rep, doesn’t have a lawyer, doesn’t get into trouble, and we can customize these shows on literally an hour by hour geographic personalized basis based on where we take it. It turns out that the whole thesis was wrong, that by all estimations, by about 2025, somewhere between 25% and 30% of the live entertainment business will come from performers that are no longer living. You will take your children to go watch the Beatles and Michael Jackson and in fact, the first deal that was done is the Elvis Presley Estate, which will be coming across North America in about twelve to eighteen months. If you think it’s weird, we know that you’ll pay the same ticket price to watch virtual Michael Jackson as you would have to watch the live performer. The data’s pretty clear about that and your emotive markers will be very similar. You can look back when we were kids and you went to the Barnum & Bailey Circus and you think about the price per ticket and what you’re watching now at Cirque du Soleil and you see the evolution of these modalities of entertainment. Let me end off in the time I’m trying to talk about consumers and the impact on marketing. Let me start with what I think are the three most important lenses around consumerism, certainly the ones that we pay attention to at CAA and the ones that were building companies off of. The first thing that I would really point out is that consumers are really notes of broadcast. That is a massive societal and historical shift. For 6,000 years, we were receivers of broadcast. Now, everyone is their own note 00:33:19 of broadcast. Each individual has their own audience, their own tonality, their own reach, their own voice. When you start thinking in the consumer business around what that means has a fundamental shift around the audience that you’re trying to sell stuff to, because before you were the broadcaster, now they’re the broadcaster. When we start to think about building, we spend a lot less time when we think about execution around what we are saying to them or what we’re doing to them and more about their role as a node of broadcast and the growth of a company or a business that we create. It’s a huge shift. Secondly, this is a big one, is to shift around adoptive culture. One of the things that is very clear over the last decade is that human beings have adopted at a pace to technology that is historically unprecedented and what you can see here are the major technological innovations that occurred over the last century or so and how many years it took them to get 25% market penetration within the United States. You can see that electricity took 46 years. The web took about seven. By the way, the web was hard technologically because you needed a cable provider to get last mile into your house. This wasn’t like it was easier or something, it’s just you’re seeing historically this willingness to adopt and try new technology at an unprecedented clip and pace. Go back to 1997 when we were freaked out and panicked about giving our credit card online. To discussions that you’re having now, just be aware that when you’re starting to think about things like AI, VR, AR and robotics, that the willingness for humans to adopt and utilize cross-generationally is unprecedented. Lastly, that what Apple and Google have done to all of us is they have created an update culture. If you looked at iOS when iOS 11 came out, 25% of the smartphone owners that owned an Apple device updated it within seven days. That is unprecedented even for Apple. There are three billion owners of what we would call smart phones. That number will rise to five billion within about 24 months. When you think about what that’s done is in the average consumer, it’s created an expectation in their DNA of consistent, reliable, and marketed product update cycles. We are in a refresh culture or an update culture and companies that don’t consistently update and refresh. It’s not just about the update and refresh, it’s about the story behind the update and the refresh and the patterned behavioral expectation. Apple fans are Pavlovian. They know that in September XY product gets released. They know at the Worldwide Developers Conference, that’s when the new OS is coming out. They’ve really patterned that behavior and that has affected a lot of other people in their general consumer life. How does that affect marketing? The first thing that I would argue is that marketing as we know it was too reliant on demographics and I would argue we are in an age where demographics are done as we knew them. You have entered into a stage of nano-demography were all of these large buckets of people that we tried to make sense of, turns out in an era where we’re all nodes of broadcast and we own our own communication scale, those buckets don’t work anymore. The billions of dollars spent on trying to figure out the millennials, for example, it turns out most of it was junk and wrong. In real estate for example, that’s just one example. There were billions of dollars spent on trying to prove the theory that millennials wanted a certain lifestyle, they want it to live in dense urban areas, they wanted different modalities of living and they were willing to co-live and there was all this stuff that went on. Do you know what ended up happening? Right now as the millennials are buying homes, they’re all moving to the suburbs. For five years, the urban centers in every city had been declining. The suburbs have been growing. You could argue that’s an economic condition, but regardless of that, there is a state where we have to be very sensitive to the fact that nano-demography and really understanding small pockets of consumer behavior is going to be much more important than trying to figure out who the millennials are. Secondly, this is also really important. All brands are now media businesses. That sounds really simplistic but it’s a massive institutional and behavioral change because before most consumer brands where consumers or advertisers, they worked with media buyers, they worked with producers. The really, really smart companies now are starting to put in place their own media units. One, because if you own your own communication at scale and that has an inverted from a power structure, you better have your own news organization to start to figure how to respond in live time. Again, I don’t mean to pick on United, but if you go back to the United story and you’ll look at the amount of time it took them to respond to that and length of the decline that happened from a brand equity perspective in that two to three days before they responded, you can’t do that anymore. You need to actually have storytellers and you need to have brand equity focused around media and responsive news organizations. You need to produce your own episodic content. You need to start producing your own product almost back to the days of the way the soap opera worked, except you’re doing it internally. Brands have to really think of themselves as media businesses. Let me talk about audience before I move onto what do you do about this. If you care about audience and where audience is going to be aggregated, here are the two largest growth sectors in the next three years. It’s gaming and it’s messaging, so if you’re not in the games business in some way or focused on the games business in some way, you’re going to miss probably the largest growth area of audience attention for media in the next three years. The other one to pay very close attention to is voice. The shift from the actual fingers being the guide in an operating system, to voice being the guide. You’ll see the growth in audio there as the third largest category. 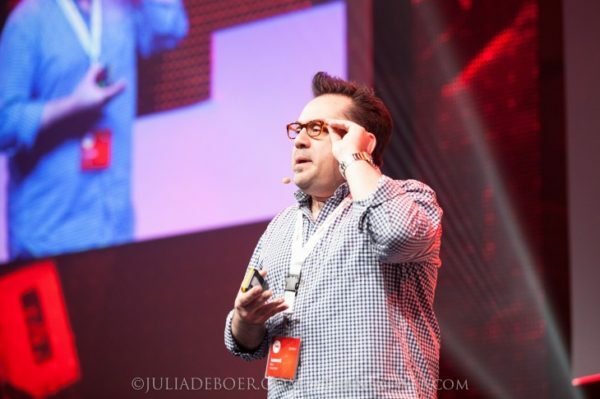 I believe the job of consumer businesses is to focus their attention on where audience is amalgamated and this is where the audience is going to be focused on in terms of growth in the next few years. What do you do about it? How do you survive and respond in a world that’s literally being rewritten around you? The answer, while very simplistic is very difficult to execute and the answer is you, one start with your DNA. Organizations will not change unless the DNA within the company is significantly changed and everyone argues it’s a top down, bottom up, it’s both. It’s a sandwiched approach. Most of the change will come from companies that are taking seriously almost an affirmative action program where they’re basically saying when we’re hiring new people, those people should have a minimum of two to three years of startup organizational behavior and experience behind them so that they start to bring changed DNA into the walls of the company and not just replicating younger existing structures with the same kinds of people. DNA is step one and very few companies do it well and take it seriously, but the second is something that I call alpha modality. This is the change of focus and framework where. I don’t mean alpha’s an alpha male, I mean alpha as in testing. Your job now is really to try to create these alpha versions of the company whose job it is to put the company out of business and those what used to be a moat wrapped around the business, that moat is gone and you now need to surround yourself and make sure that you’re heavily invested in and heavily engaged in the products and companies that are going to put you out of business. By the way, the other meaning of this is roughly somewhere between 15% and 20% of your customers are happy to test stuff with you. They’re happy to get in the mud. They’re happy to create groups where you say, “We want to test a new product.” You should never say no to stuff. You should always say no subject to a test and that test should be worked with an alpha modality group where you say, “We don’t know if this is going to be live. We don’t know if we’re ever going to do it. It’s going to be messy. It’s going to be buggy, but you want to test this with us.” You’d see generally speaking between 15% to 20% of your consumers saying yes, and why would you do that? You do that because it’s incredible usage in UX behavioral data they can utilize as you’re making better decisions. The Great Rewrite: When you’re starting to think about things like AI, VR, AR and robotics, the willingness for humans to adopt and utilize cross-generationally is unprecedented. The best example of that is Tinder. Tinder is the largest dating site in the world created by the largest dating site in the world. Tinder was owned by Match.com. Match was chaired by Barry Diller at IAC and Barry walked in and said, “One day, you can’t innovate anymore. It’s not your fault, but I’ll fix it.” He partnered with a company out of Toronto, which I’m a shareholder and called Xtreme Labs and created something called Hatch. Hatch lived in the first floor of the IAC Building. Day one, Barry Diller walked in and said, “You see these people upstairs, put them out of work.” He never ever came back once. The creation of that was Tinder. When Match went public, 60% to 65% of their market cap came from Tinder. At CAA we started doing this because when we looked at the audience numbers, we started getting very heavily into voices and operating system. By the way, it’s not a very lucrative gig right now. We’re not clear how you monetize voice. We’re not clear how it’s going to work, but we’re very heavily invested in it and some of you may have seen recently that we launched a news network, piloted with former Vice President Biden, which was a product that we launched specifically focused on trying to understand how news and consumption of media is going to happen when fake news is so proliferated. If we can create curated editorial voices, can we monetize that. This took us about a week and a half to create and about ten days’ worth of discussion and conversation before we took it live. Will it succeed? We have no idea. We don’t even know what success looks like other than the audience itself, but it just gives you a sense of the stuff we’re doing. Here’s how you do it. You follow the rule of ten. All of the good companies are focused on 10% of their revenue, 10% of their cap backs, their table and their time focused on this alpha modality. The really good companies are the ones that forced 10% new revenue from new products every year. 10% new revenue and new product every year is really the goal for the companies that survive. Many like Samsung and other companies are well north of 30%. It just gives you a sense and while I can’t give you some playbook for how you survive in a world that’s being rewritten around you, I can tell you for sure that this is going to be one hell of 730 days. Thank you very much. I appreciate it. 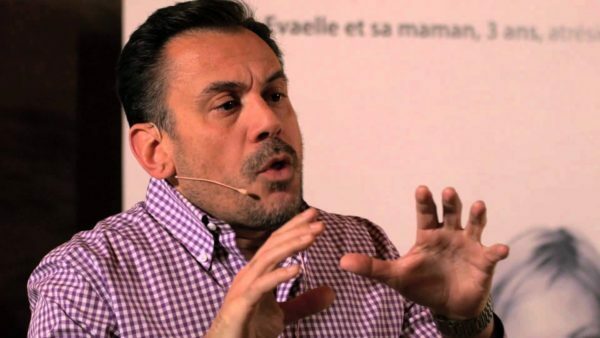 Leonard is a highly respected entrepreneur, venture capitalist and best-selling author. He has helped in raising millions of dollars for startup companies, been through one of the largest internet IPOs in history and has been involved in the building, financing and/or sale of five companies to date. Much critical acclaim has followed him in his endeavours. At Onvia Canada (where he was part of the initial executive) the company was voted Canada’s number one startup in 2000 and subsequently closed a $240 Million IPO on NASDAQ. In addition, at Marqui, where Leonard was Chief Advisor, the company was rated as the best new technology company in the country in 2003. 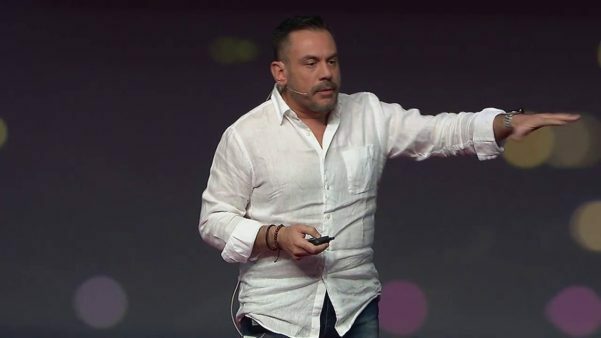 Currently, Leonard is Co-CEO and a Director of NowPublic which is one of the pioneers in citizen journalism and quickly becoming one of the largest news agencies in the world. He is also a Venture Partner at Growthworks Capital, one of Canadas largest national technology funds, and acts as an advisor to venture capital funds in the US, Europe and Asia. 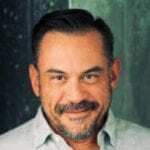 He is also a board member and/or advisor to several companies including Infowave, Sonic Foundry, Derby County Football Club in the English Championship, CanWest Global and Alliance Atlantis. Leonard is currently an advisor to the Canadian Ministry of International Trade and a Director of Canadas largest technology association, CATA. 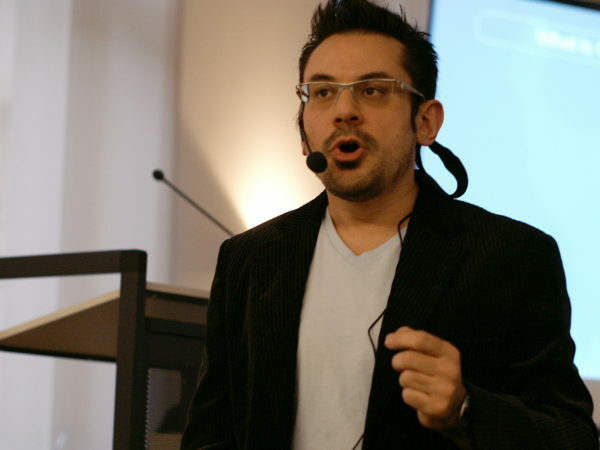 A highly sought-after public speaker, Leonard has lectured at universities and conferences throughout the world. He is co-author of the best selling books, Innovation Nation: Canadian Leadership from Jurassic Park to Java and Everything I Needed to Know About Business…I Learned from a Canadian both published by John Wiley and Sons.